The Hennepin County Medical Examiner has identified the two people who died in a murder-suicide that began at a McDonald’s in Maple Grove Sunday afternoon. 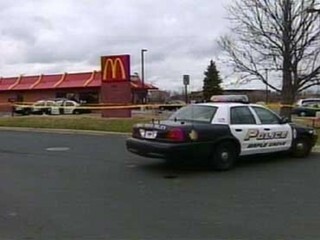 Twenty-four-year-old Heather McPherson of Plymouth was planning to end a relationship with 24-year-old Sedric Larkins of Blaine and was shot and killed by him in the parking lot of a McDonald’s restaurant in Maple Grove, according to police. A short time later, the Larkins was found dead after police surrounded his vehicle on a busy interstate. Police said Larkins pulled out a long range shotgun and shot McPherson once. He then stood over her body shot her again. He fired at least two more shots at vehicles in the parking lot. Several people at the restaurant called 911 and gave authorities Larkins’ license plate number. Brooklyn Park Police tracked the car to Interstate 694 near Highway 169 where they pulled him over and surrounded the vehicle. When officers approached, they found Larkins dead inside. 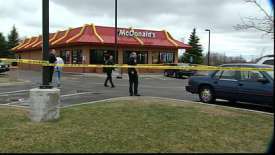 Friends are shocked that a man allegedly shot and killed his girlfriend outside of a McDonald’s restaurant Sunday. Maple Grove Police say Heather Rose McPherson and Sedric Larkins, both 24, were supposed to meet at McDonald’s Sunday afternoon. McPherson was going to end their on-again, off-again relationship. But Larkins showed up with a shotgun and opened fire outside of McDonald’s, hitting McPherson at least twice, police say. She died at the scene. Larkins fled the scene. Within ten minutes, a Brooklyn Park police officer spotted his speeding vehicle and pulled him over along I-694. By the time officers approached the vehicle, Larkins had shot and killed himself. Police say McPherson had a nine-year-old daughter. Her family declined to comment Monday. A friend of Larkins tells KARE 11 that his friend was “the most caring person in the world.” He says the couple was going through hard times and they argued frequently, but he says his friend was not aggressive and would never harm anyone. Domestic abuse experts say, if McPherson feared for her life, she was wise to meet him at McDonald’s, even though the relationship ended tragically. “One of the things we advise women, if they’re afraid of this person, is to go to a public place that may be safer to be meeting in public, where the person may not blow up, get angry or be abusive,” says Carol Arthur, executive director of the Domestic Abuse Project. Arthur points to red flags, which indicate whether someone is capable of domestic homicide: has the person ever threatened you with a weapon or threatened to kill themselves? Is that person depressed or abusing drugs and alcohol? It’s unclear if any of those red flags apply to Sunday’s case, but any person who fears for their safety is advised to seek help from a domestic abuse shelter. You can also call the Metro Crisis Line 24 hours a day at 866-223-1111.